It's not a wild theory any more. Under US law, sure - and he will. But he can't pardon himself under international law. 1. US recklessness tanks the world financial markets. 2. Standard of living in US declines precipitously. 3. The last remaining 20% of the US that supports Bush (including the corporate news media which made him possible in the first place) finally withdraw their support. 4. 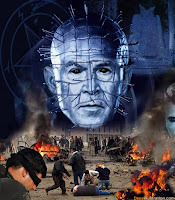 War crimes charges filed against Bush by an international body. 5. The US hands Bush over with glee and the same US news media which made him possible now presides over his being publicly torn limb from limb. It won't be the end of the criminal Bush family dynasty, but their ability to steal and wreak havoc will be greatly diminished. Unfortunately, Cheney will die of a heart attack before he can be sentenced. world will be concentrated next week. The goal of the operation will be to duplicate or surpass the bloodbaths at the Mexico City 1968 and/or Munich 1972 summer games. Commandant Seyfullah of the Turkestan Islamic Party (TIP) claims in a video tirade displayed by a US company's website to represent the Turkish Moslems of Sinkiang province or Chinese Turkestan, where the Anglo-Americans have long sponsored an abortive separatist movement. Patsy leader Seyfullah and his Turkestan Islamic Party have been indirectly mentioned twice over the past two years by Ayman Zawahiri, the veteran British agent who functions as the real leader of al-Qaeda, in effect sheep-dipping the little known TIP in the vast pool of al-Qaeda notoriety. If the planned operation actually takes place, the current Chinese leadership will - in the hopes of the plotters - lose face and forfeit the mandate of heaven, the prerequisites for continued rule. This could then be the prelude to the installation of a new Chinese government far less committed to the Shanghai Cooperation Organization and to cooperation with Russia. It might be a first step towards splitting the SCO and turning Beijing against Moscow, which is the current goal of Anglo-American grand strategy. Despite ample international attention to the Beijing Olympics by the controlled media, these considerable terror attacks have scarcely been reported, suggesting that some form of information management regime may be in place, as it was before 9/11. The threatened Olympic terror event may have a second phase, designed to prevent a wave of world sympathy for the Chinese and other victims of whatever happens. An attempt to disrupt the world-wide operations of the internet may ensue, presented as the retaliation or riposte by the Chinese for what has been done to them by the foreign devils. Logic bombs or more sophisticated means could be used to disrupt the world-wide internet, shutting it down in whole or in part for days or weeks. International financial transactions might also become chaotic. Someone might begin dumping US Treasury paper, with the controlled western media blaming the Chinese government, even though the prospect of any direct or immediate Chinese government retaliation is remote. The massive hardships that can be inflicted by computer and cyber-based disruption would be used to whip up resentment and hatred in the west against the Chinese, changing the world strategic climate dramatically. Some patsy group calling itself a Chinese secret society might announce that it had finally become fed up with the arrogance, the interference, and the aggression of the Anglo-Americans, and that it had decided to strike back on its own. This would allow the US and UK to demand that the Chinese government hand over these malefactors in a humiliating gesture, leading to an escalating diplomatic and strategic crisis. These are but a few crude hypotheses drawn from the immense pool of possibilities. In many of these we see that the scope of terror could suddenly become much larger, due to immense strategic potential on the Anglo-American and Chinese sides. 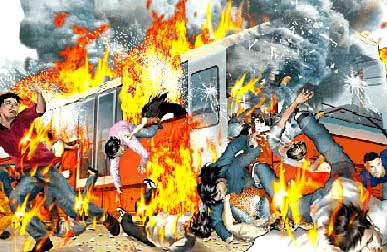 The direct terror attack may also be supplemented by large scale provocations, chaos and confusion operations, and mass demonstrations by Falun Gong fanatics, by Tibetans loyal to the feudal latifundist and US-UK intelligence asset who calls himself the Dalai Lama, and/or by democracy and human rights activists assembled by Amnesty International, Human Rights Watch, and various NGOs in the orbit of US-UK and NATO intelligence. But the vigilance of the Chinese regime may be enough to defeat these plans. If any such attack occurs, it would represent the beginning of a whole new phase of false flag terrorism on a world scale. From the mid-1990s until about 2005-2006, patsy organizations like "al-Qaeda" in many cases received the blame for false flag terror attacks carried out by the US-UK invisible government networks against their own countries or their own national assets abroad, as in the case of the 9/11 attacks in the US and the 7/7/2005 attacks in London. The goal of these operations was to whip up hysteria in the western countries, and to provide pretexts for direct aggression under neocon auspices against Afghanistan and Iraq. There was also a parallel track of NATO-backed Chechen terrorist attacks against Russia. Henceforth, patsy groups like the TIP are to be used increasingly against "enemy states" like China and Russia, the two targets who have gone to the top of the list, displacing the earlier focus on the far less significant Iran and North Korea. Any attacks by the TIP on Chinese territory will of course represent acts of war by the US-UK against China, and could easily generate incalculable consequences over time. Under the Brzezinski Plan, the US-UK will be messing with the biggest country in the world, and one which comes equipped with ICBMs and H-bombs that can strike US territory. Pentagon boss Robert Gates (right), a Brzezinski man going back to the Carter NSC in 1977-79, said this week that irregular warfare and soft power are the wave of the immediate future, and that may be exactly what we are about to get in spectacular form. This speech may well have been a signal that something big and very messy in the irregular warfare department is about to happen at the Olympics. "Al Qaeda," the CIA's Islamic Legion, traces its origins back to the Carter-Brzezinski years, just after the Soviets invaded Afghanistan in response to Brzezinski's playing of the Islamic fundamentalism card against them. The new target list is being dictated by the Principals' Committee, which currently rules in Washington. Among the Principals are Rice at State, Gates at Defense, Paulson at Treasury, and Admiral Mullen as head of the Joint Chiefs of Staff, plus some others. This group is now running the US government. Bush and Cheney are little better than figureheads, lame ducks who have virtually ceased to influence government affairs as they fade away. The top neocons are either in jail, like Lord Conrad Black, or running for cover. The playbook for the Principals is the Brzezinski Plan, with its focus on working towards a global showdown with Russia and China. A US-UK attack on Iran is now virtually excluded, but instead large-scale bombing and preparations for a land invasion of northwest Pakistan are proceeding apace. The pretext cited here is the search for Bin Laden and the need to combat the Taliban, but the real goal is to start the breakup of Pakistan into five or six petty states - because Pakistan is a Chinese ally, and all allies and trading partners of China are presently being targeted for regime change, destabilization, and Balkanization, from Sudan to Zimbabwe to Burma to Venezuela to Pakistan. 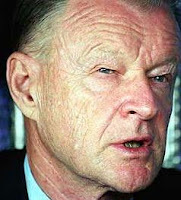 It is time for opponents of false flag terrorism to ditch their maps of the Persian Gulf in favor of much larger world maps, with special attention for the geopolitical features of the Eurasian landmass discussed by Obama backer Brzezinski in his book, The Grand Chessboard. The atmosphere in Washington today is eerily reminiscent of the final years of Iran-contra, when many personalities who had become too openly compromised in these picaresque operations were liquidated. The Iran-contra networks had to be cleaned up, and many heads rolled. The past weeks have brought word that bacteriological warfare expert Dr. Steven Hatfill, the FBI's former person interest in the October 2001 anthrax attacks, has been taken care of with a $6 million damages award. His former biowar colleague Bruce Ivins was found dead this morning near Fort Detrick in Frederick, Maryland, in what has been ruled a suicide. The death of Ivins comes in wake of another purported suicide, that of Deborah Palfrey, the so-called DC Madam. Are these inconvenient persons in fact being suicided to keep them quiet? Tonight there is word that Ayman Zawahiri (left), the MI-6 man at the top of "al-Qaeda" may be either dead or seriously wounded. 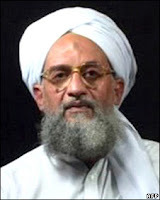 If Zawahiri is dead or knocked out, this event may be comparable to the execution of Timothy McVeigh on June 11, 2001, which officially closed the era of terrorism under right wing anarchist cover in the US, just before a new phase of false flag operations began three months later, on September 11, 2001. 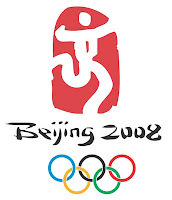 August 8, 2008, the formal opening ceremonies of the 2008 Beijing summer games, emerges as a possible date for some attempted action in the context described. In a paper which should be read in conjunction with this article, Gillian Norman makes a case for the occult significance of 8-8-8 in the irrationalist numerology which may be considered meaningful by certain rogue network factions. But the events in question could occur at almost any time over the next several weeks. 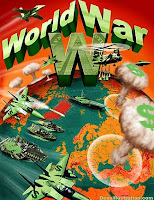 Those who mobilized in the spring of 2007 to stop Operation Bite, the planned Good Friday US-UK attack on Iran, or who spread the word of the Kennebunkport Warning in late August 2007, are urged mobilize now on a much larger scale to inoculate world publics against which may now be in the offing. The US, Europe, and Japan need good relations with China, the world's largest country. Peaceful coexistence, not a new round of inter-imperialist rivalry, is required. No band of desperados can be allowed to initiate a Sino-American confrontation under cover of a new false flag provocation. A CHINESE terrorist organisation has warned it will create havoc at next month's Olympics and has claimed responsibility for a deadly Shanghai bus bombing in May. A group monitoring terrorism threats on the internet said Commander Seyfullah of the Turkestan Islamic Party claimed responsibility for several attacks in China less than a fortnight out from the Olympics. "Through this blessed jihad in Yunnan this time, the Turkestan Islamic Party warns China one more time," Seyfullah said in a video dated July 23, a transcript from a US-based intelligence centre shows. "Our aim is to target the most critical points related to the Olympics. We will try to attack Chinese central cities severely using the tactics that have never been employed," he said. The warnings come just a day after Chinese police claimed they cracked a terrorist cell planning to attack Shanghai Stadium where the Australian men's soccer team will open its Olympic campaign on August 7. Seyfullah claimed responsibility for the May 5 Shanghai bus bombing, which killed three; another Shanghai attack; an attack on police in Wenzhou on July 17 using an explosives-laden tractor; bombing of a Guangzhou plastics factory on July 17, and bombings of three buses in Yunnan province on July 21.